Tiny home neighborhoods are slowly starting to pop up across America. While tiny homes are still widely illegal in the U.S. because they often don't meet zoning and building standards, some cities are changing ordinances to allow the downsized dwellings -- and even developing entire communities. Tiny homes are usually defined as those between 200 and 600 square feet (though some can be as small as 80 square feet), and can be set on wheels or on a foundation. While they're usually more affordable than traditional homes, the appeal isn't strictly financial. It's also about simplifying one's life, and building closer relationships with other household members and neighbors. Planners and builders are starting to create new neighborhoods and subdivisions where tiny home enthusiasts can live together in towns across the country, including in Texas, Florida and Colorado. 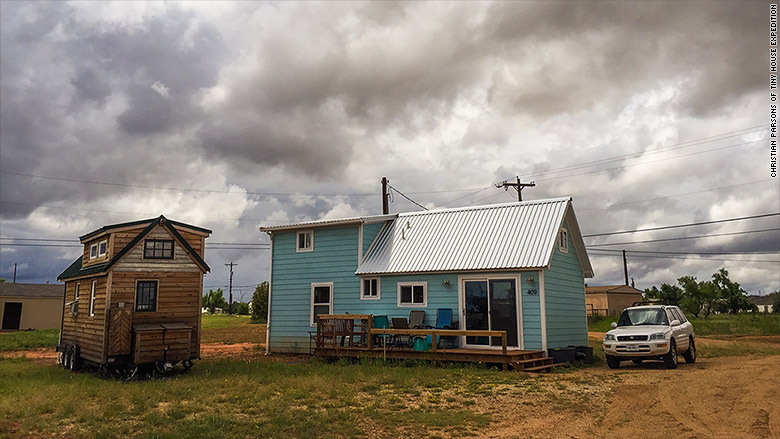 Spur, Texas, changed its local laws in 2014 and claims to be "America's first tiny house friendly town." "Most of America is struggling with affordability, said Alexis Stephens of Tiny House Expedition, who is also working on a documentary on tiny home living. "We can activate existing land and create housing that is affordable by design." The small west Texas town's population was shrinking as people left for bigger cities. Now, its welcoming attitude toward tiny homes has generated a lot of interest and brought new residents. "When you bring in new people and new homes, it's a boost to the economy," said Danny Schallenberg, a tiny house builder and developer in Spur. 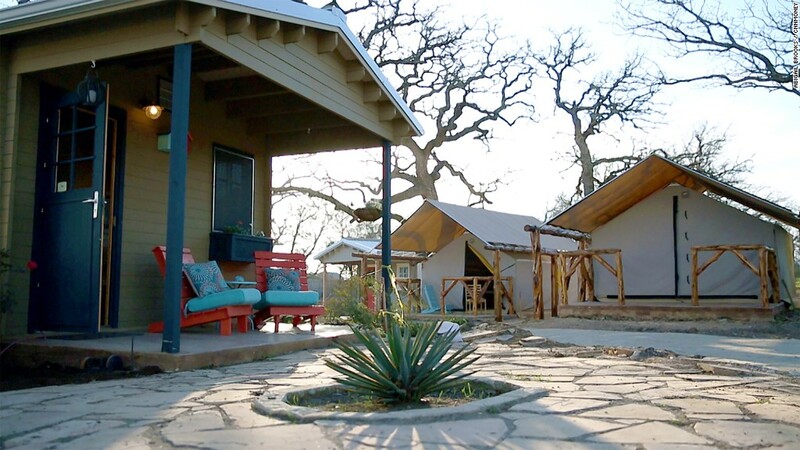 Spur, Texas, changed its local laws to allow tiny homes, and has a tiny home neighborhood in the works. Tiny home dwellers can buy a lot of land in the city to build on, and Schallenberg is also in the process of building a tiny home subdivision. This "pocket" of tiny homes is about a mile from the downtown area, will sit on two acres and have 22 homes. "This is a fairly new concept in the tiny house world: ownership of a house and land in a subdivision." The properties will be a mixture of one or two-bedroom one-level homes that will be close together to promote a sense of community. Each house will have its own driveway, and will be priced between $30,000-$50,000. "I am taking calls every day for the subdivision, to live in it" said Schallenberg. In Rockledge, Florida, another tiny home community is in the works, thanks to resident Rene Hardee. Two years ago Hardee decided it was time to downsize her family from their 2,000-square-foot three bedroom, two-bathroom home. But even after watching a documentary and attending a tiny home workshop, she still wasn't clear how to go about legally building and living in one. So she started asking local government officials. She initially was just seeking the OK to build a tiny house for her own family, but the idea expanded. "They didn't feel like they could get behind a one-off," she said of the city council. "They thought it would look weird if everyone else has a 2,000-square-foot home and I am building so small." So Hardee began developing plans for an entire community of tiny homes. The city has since changed its zoning laws and they've nearly settled on a site plan. Now Hardee is looking to find a developer to build the neighborhood -- which has been challenging. "It's a developer and builders' market. There is a lot of building going on in this area, they are choosing between multi-million dollar projects." She hopes the neighborhood will be built in a year. The current plan is for 13 homes, and there's already been major interest. "I am very busy fielding calls and meeting with people," said Hardee, who also started a Facebook page about the project. She is excited about the sense of community she hopes will be created in the subdivision where residents share resources and know each other well. Hardee plans to live in a 600-square-foot home with her family and they're already downsizing their lifestyle. They got rid of most of their kitchen supplies, her husband is down to five work uniforms, and they purged about 75% of their kids' toys. "Just getting rid of the redundancy, it was like 'wow, this is so much better.'"